Overview: Samsung Electronics America, Inc. today announced availability of the Series 9 Premium Ultrabook with Full HD (1920x1080) resolution. The laptop is available now for an MSRP of $1,399.99. In addition to Full HD resolution, the Series 9 features a Samsung SuperBright™ display (300 nit), making it up to twice as bright as standard notebook screens. The Series 9 reproduces up to 16 million colors, making it ideal for viewing photos and videos. The wide viewing angle and matte display allow users to appreciate the rich picture quality in all lighting conditions, both inside and out. Weighing only 2.5 pounds and measuring just a half inch thin, the Series 9 can effortlessly be carried anywhere. The build is nearly seamless, using an aluminum single shell body and featuring the well-known Series 9 hallmark polished edge. Key components such as the display panel, keyboard, motherboard, cables, fans and battery have been customized with precision to fit into the Series 9’s ultra-thin body. Additionally, the Series 9 has been sand-blasted for fingerprint resistance, keeping it pristine at all times. Powerful internal components, including an Intel® Core™ i7 processor and 128GB SSD*, ensure rapid startup and load times that enable users to access their content and applications nearly instantly. 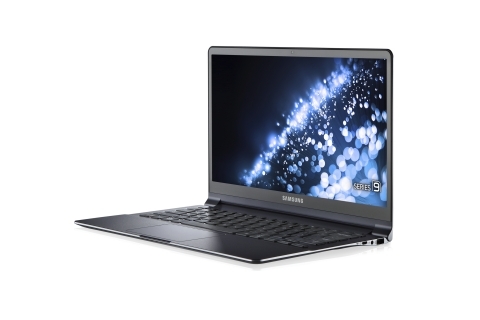 The Series 9 features Samsung’s Fast Solutions technology, allowing the laptop to boot in less than 10 seconds and resume from sleep nearly instantly, allowing users to rapidly pick up where they last left off. The Series 9 also features an integrated Intel® HD Graphics 4000 chipset which, when combined with the Full HD screen, makes this the ultimate laptop for consuming multimedia. For maximum on-the-go connectivity, the Series 9 offers up to 5.8 hours (Mobile Mark 2012) of battery life, so users can stay powered all day without needing to seek out a power source. The combination of Samsung’s PowerPlus charging technology and an advanced Lithium-Polymer battery gives the Series 9 battery a lifespan that is up to three times longer than a conventional battery. The Series 9 Premium Ultrabook with Full HD resolution is available now for an MSRP of $1399.99 through a variety of retail channels. For more information, or to find a retailer near you, please visit www.samsung.com. Dimensions 12.35" x 8.60" x 0.51"
Headquartered in Ridgefield Park, NJ, Samsung Electronics America, Inc. (SEA), is a recognized innovation leader in consumer electronics design and technology. A wholly owned subsidiary of Samsung Electronics Co., Ltd., SEA delivers a broad range of digital consumer electronics, IT and home appliance products. Samsung is the market leader for HDTVs in the U.S. and America’s fastest growing home appliance brand. To discover more of the award-winning products you love with Samsung, please visit www.samsung.com. *Accessible capacity varies; MB = 1 million bytes, GB = 1 billion bytes, TB = 1 trillion bytes. Please note that a portion of the hard drive is reserved for system recovery, operating system and preloaded content software. **Total amount of available memory may be less based on system configurations, graphics support, and other factors.